Properties in Romans-sur-Isère average 4.5 out of 5 stars. Property 3: room with sitting area, tv, desk, shower and washbasin. Charming house, all comfort with views over the Rhone and the hills of Tain. 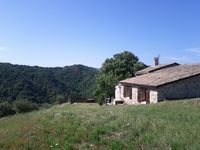 Property 17: Charming house, all comfort with views over the Rhone and the hills of Tain. Valencia Center, Cozy apartment with garage. Property 18: Valencia Center, Cozy apartment with garage. Maison de vacances confortable pour 4 | piscines, sauna et plus! Property 27: Maison de vacances confortable pour 4 | piscines, sauna et plus! Studio calme et spacieux | 2 piscines, sauna et divertissements! Property 31: Studio calme et spacieux | 2 piscines, sauna et divertissements! Maison de vacances spacieuse | 2 piscines, sauna et divertissements! Property 33: Maison de vacances spacieuse | 2 piscines, sauna et divertissements! Paul was the perfect host and gave us lots of ideas for short hikes and excursions in the area. In addition, the kitchen is very well equipped so we could prepare some great feasts - which is a nice change from eating out. The layout of the g&icirc;te was great and the place is so quiet everyone slept really well. I&rsquo;d highly recommend this location for anyone wanting a little bit of time away from the city. Thanks for your hospitality Paul!! !